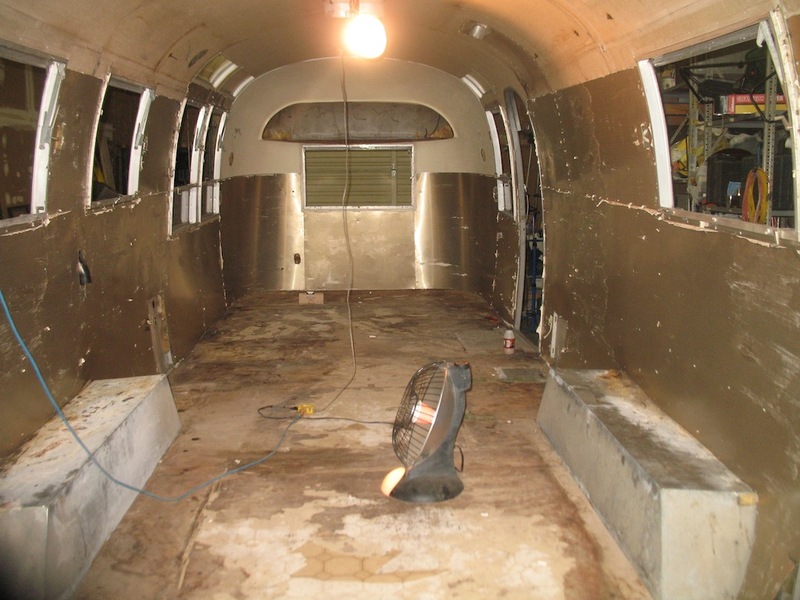 This past week was spent dry fitting the floor and the shell to the floor. The hoist system made this process as painless as possible. 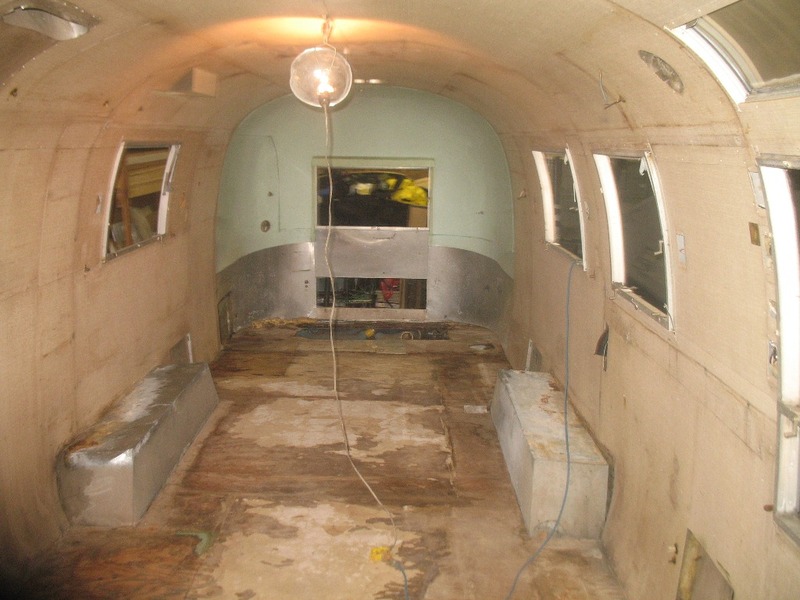 The two most difficult areas were the door and the rear outer curve since both of those areas were not original by the time the trailer was in our hands. 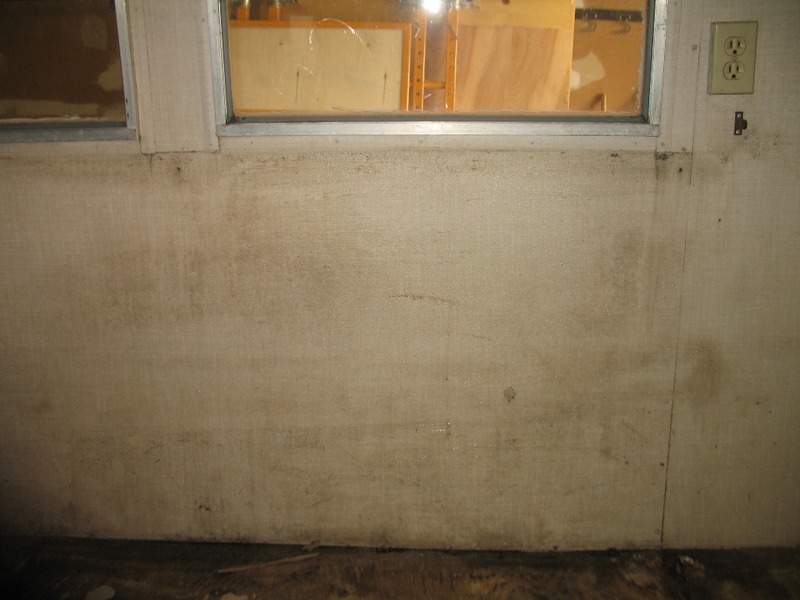 The door inset in the floor will be cut completely through for the first 1/8″ and then sealed. The new flooring is thicker than the original so there is a little “gap”, but this new floor is very sturdy! 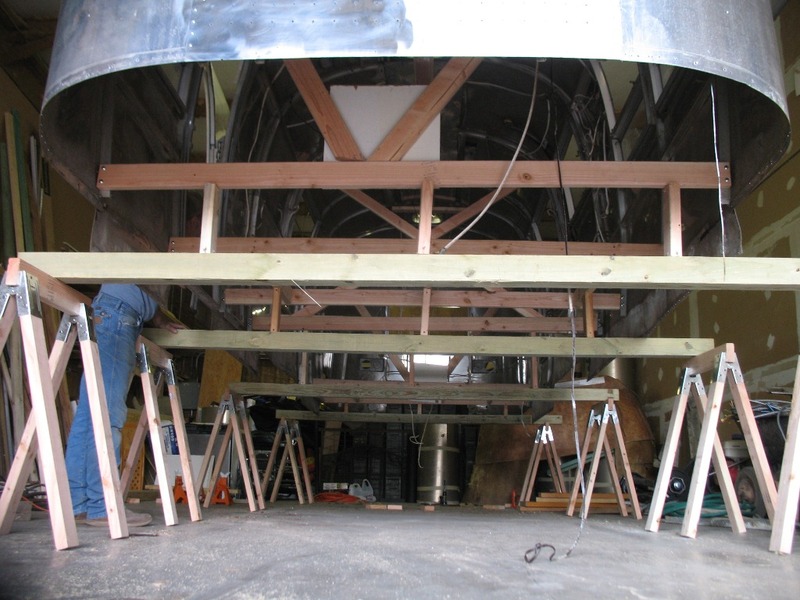 It is such a great feeling to have the shell sitting back on the frame, but later the day that picture was taken the shell was once again raised up to make room to paint the floor. 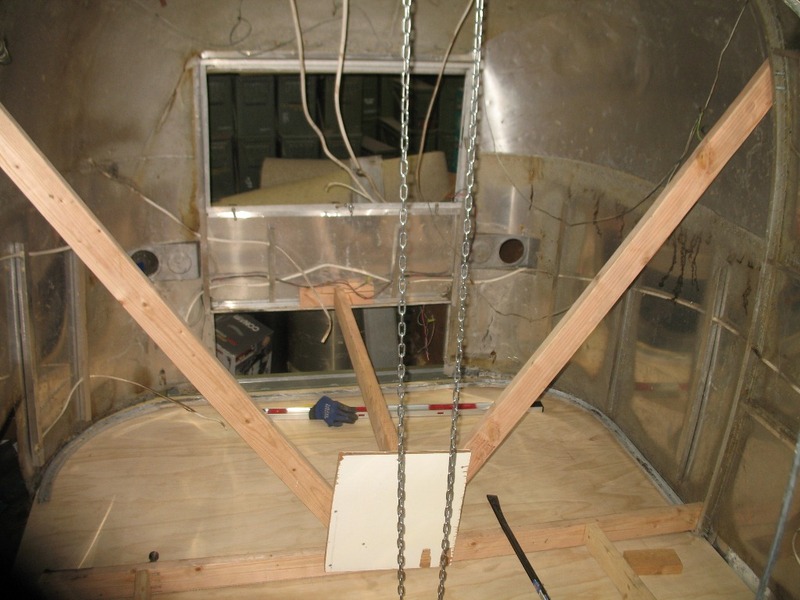 Once the floor and shell dry fit was completed then all of the new elevator and bolt holes were drilled. 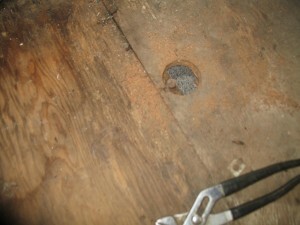 The elevator bolt holes were all countersunk with a Forstner bit and ready for their bolts. The new floor is 3/4″ AC plywood that will be coated on all sides with a good floor paint. There will be many more elevator bolts in the new floor than were there originally, at least twice as many. 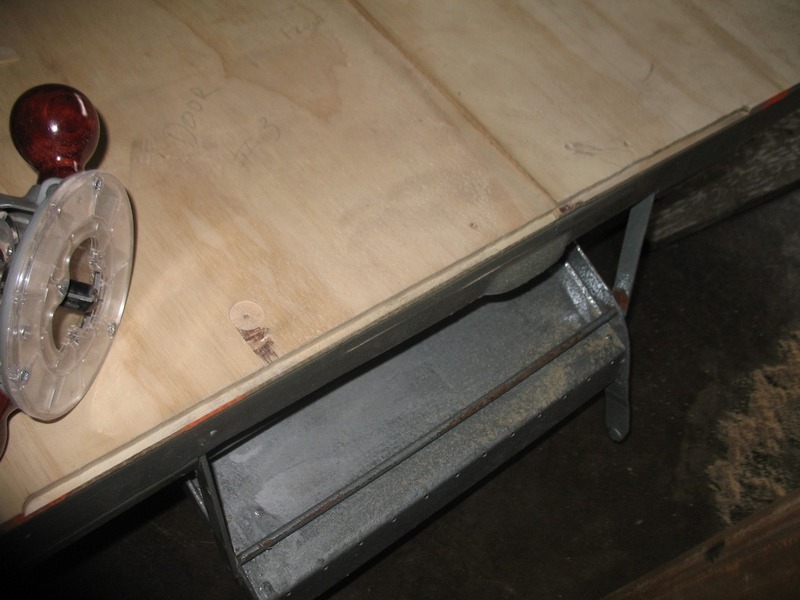 The new elevator bolts also have 1″ heads and will really help keep things snug and secure. The picture below has a few elevator bolts just stuck into the holes, but nothing has been tightened down since the floor needs to come off to get it’s bottom and sides painted before we install them for good. 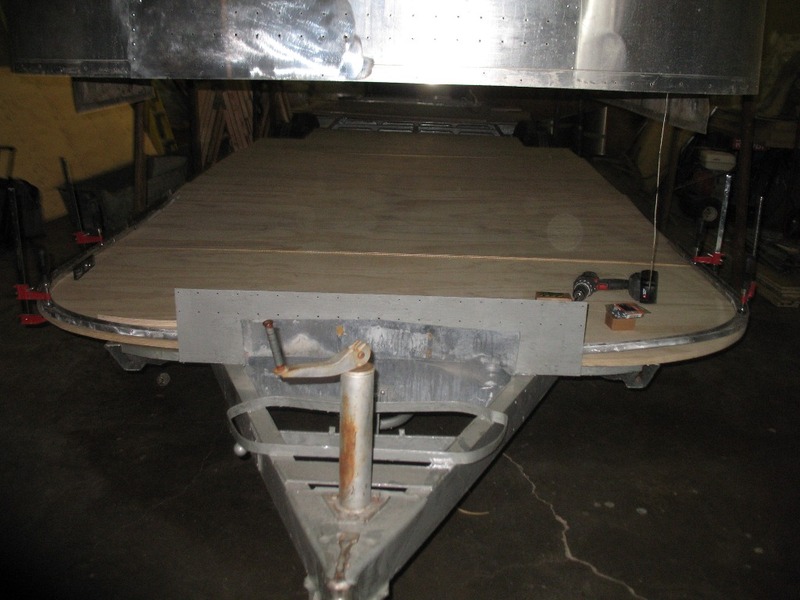 Already this week the bottom and sides of the floors have been painted and also the plywood support members. 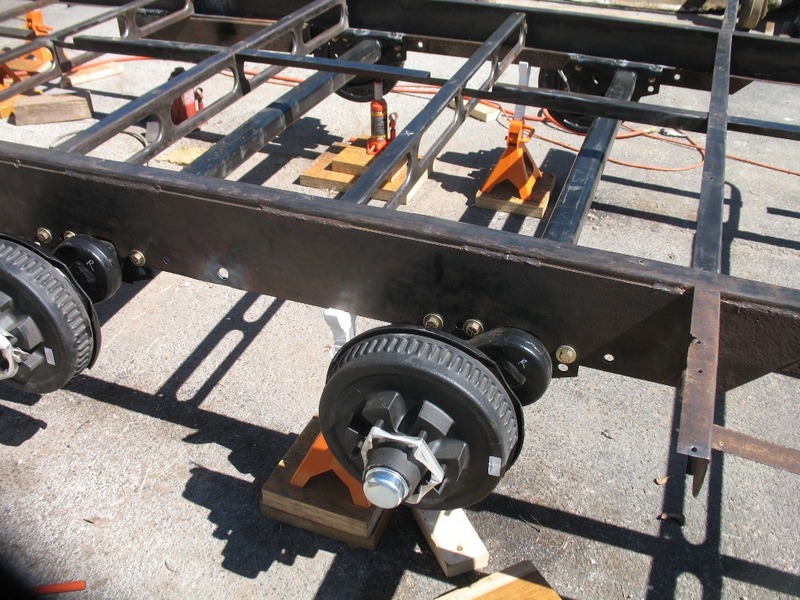 The frame area of the wheel wells and axles were also painted with POR-15 black chassis paint, but we ran out on the street side and have to wait for more to arrive via mail since there are no local sources for that product. If you are planning on using that chassis paint then make sure you get enough since it goes on like tar, but gives and absolutely amazing finished result that you will see in next week’s post. The aluminum for the belly pan and a few c-channels is also on it’s way so the next few weeks should be really fun as the trailer starts to come back together and will very shortly be towable! 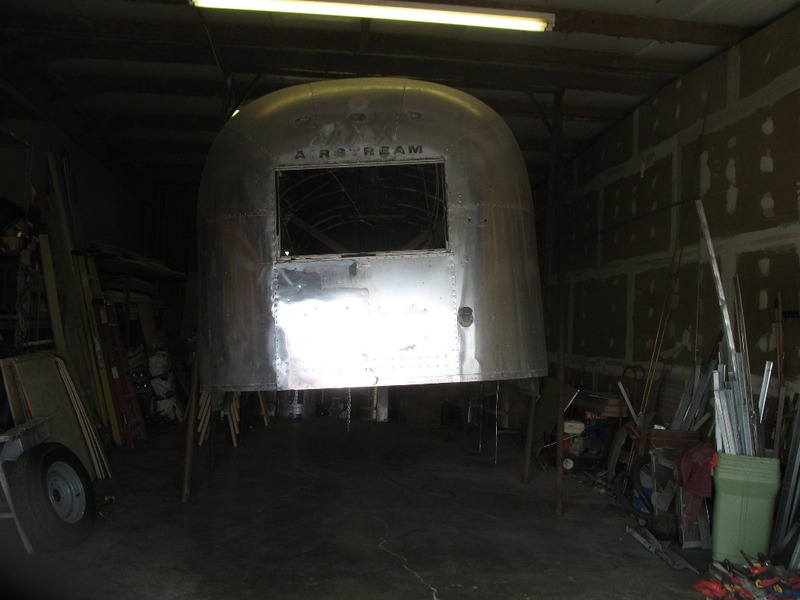 Last week was a fairly productive week with the frame being coated with POR-15, installed the wheels, repaired the exterior wheel well covers, and worked on dry fitting the floor. 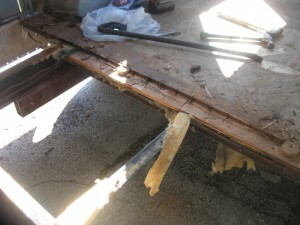 Here is a picture of the repaired frame from the previous week. The POR-15 went on really well with two coats. 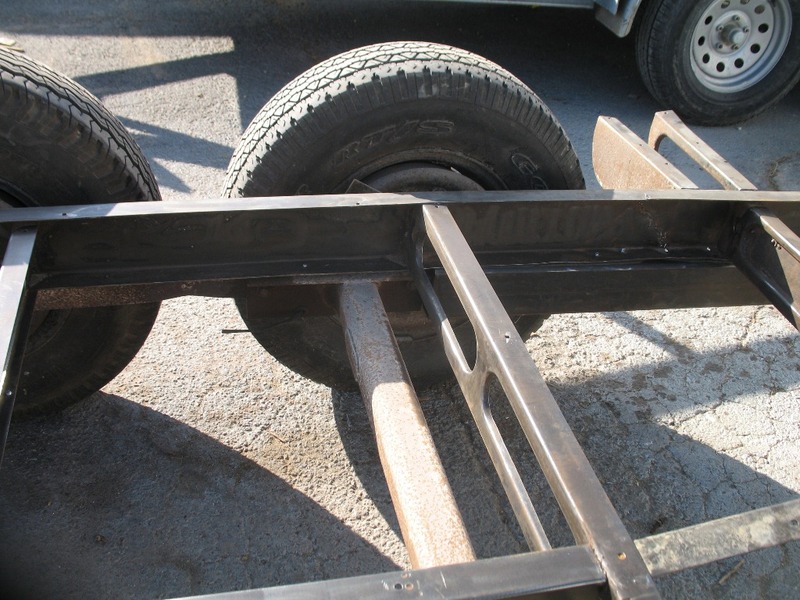 We will be putting on a top coat of POR-15 black chassis paint on the axles, frame wheel well area, and the exterior wheel well covers later this week. It took a gallon to coat the bumper to most of the hitch area two times. We will finish the bumper and hitch later and then have a silver top coat of POR-15 that is UV resistant. 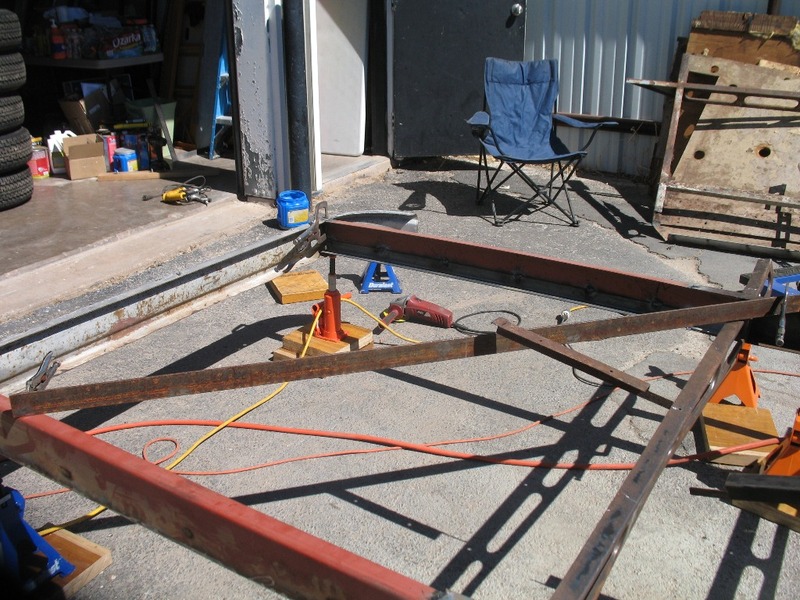 We moved the a-frames into the shop and lifted the shell off of the 4×4 supports. The a-frames make this such an easy process and took no time at all to setup. We then moved the frame under the shell to get it ready for a dry fit. The shell looks a little crooked in the pictures, but we added some counter weights later and that got it to sit perfectly level. 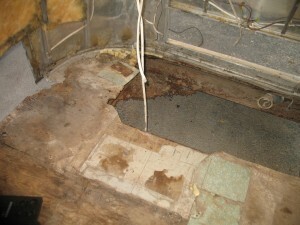 The floor has been cutout and waiting for a week or so now. We dry fitted the floor and it looks pretty good. 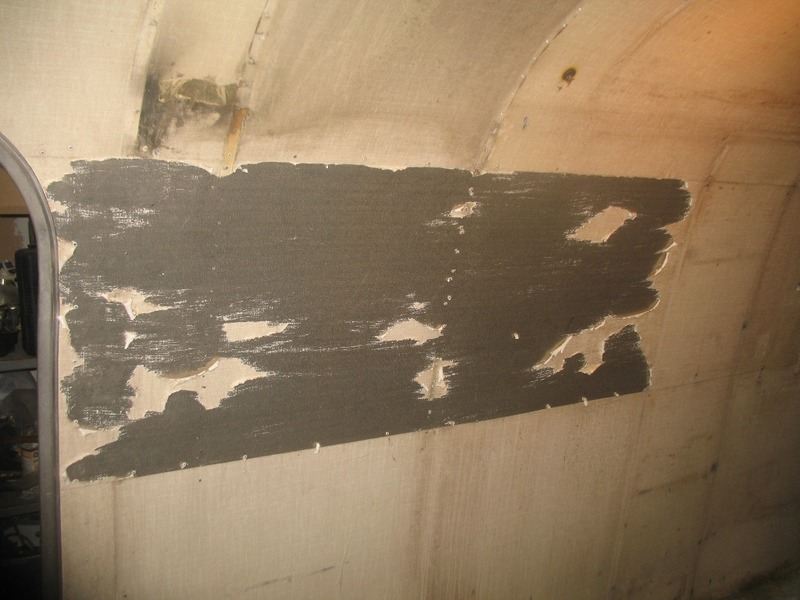 The front curved area was partially rotted, but we were able to use the c-channel that was still in great shape to create our pattern. 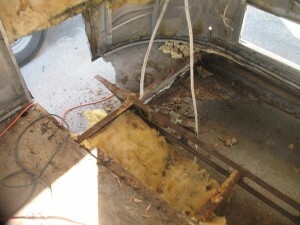 The rear was almost completely rotted and the c-channel had broken into three different pieces. 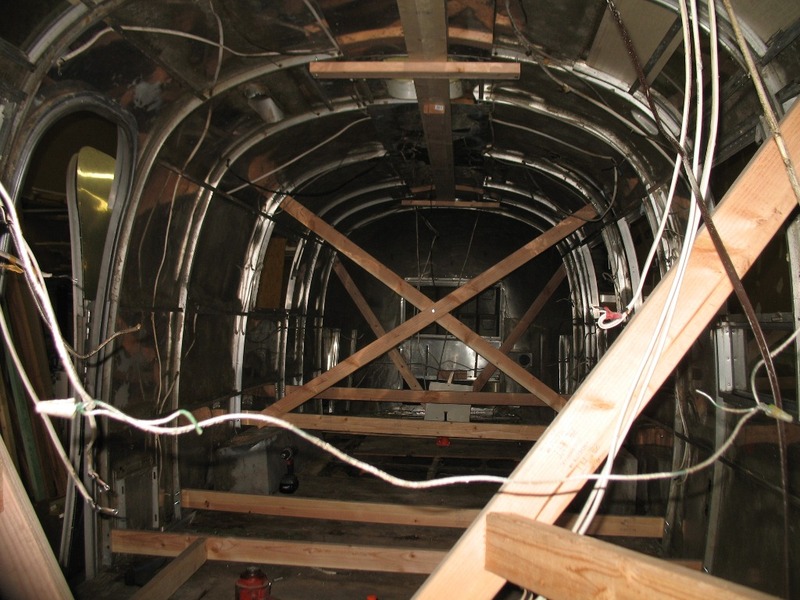 We are going to use a combination of the c-channel that has been spliced back together and the curve of the shell to trace a pattern and get the rear floor cutout probably sometime tomorrow. 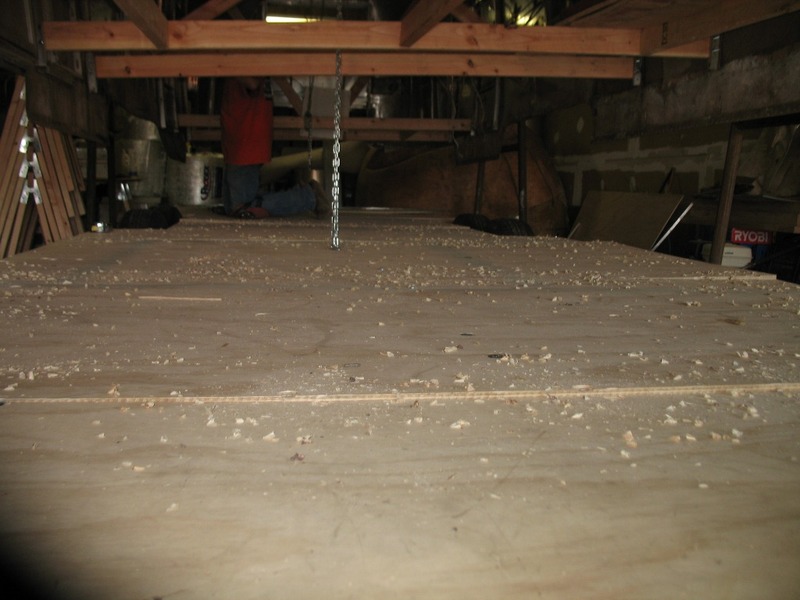 This update is a little late and already this week the floor has been partially bolted down for a final dry fit. The shell went on almost perfectly and a notch was made for where the door frame is inset into the floor. We are still awaiting price quotes on aluminum so the shell will have to come up again once we have the front banana wraps and the rear belly pan aluminum ready to install. The new hoist system makes that a one man job that takes very little effort. This was a busy week and it feels like a lot happened, but not much visible change to most people. 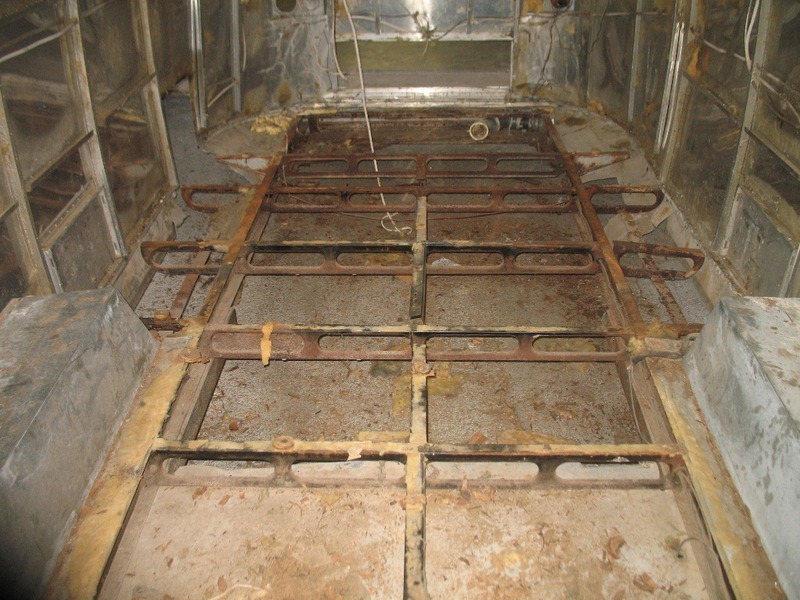 The entire frame was cleaned with a wire wheel and then cleaned using the marine cleaner from POR-15 in preparation for the POR-15. The frame looks almost new after all of that work and I need to take a picture of how the tongue and bumper look after the cleanup process! 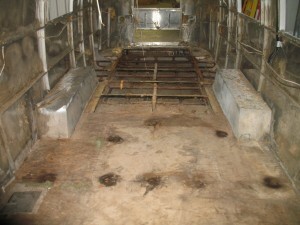 The new floor was all cut out, with the exception of the last rear piece. We spent some time trying to find someone locally that could fabricate a new bent piece of c-channel for the rear as it is broken into 3 pieces. I found a place with a 12′ brake and a mammoth bender, but the c-channel material is too flimsy to make it through the bender. We are just going to repair the channel ourselves, but someday might try to weld two c-channels together and then see if that would run through the bender. All of the old c-channel has been cleaning up pretty nicely. 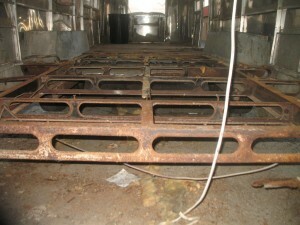 The exterior wheel wells also began getting a restoration and more pictures on that next week. 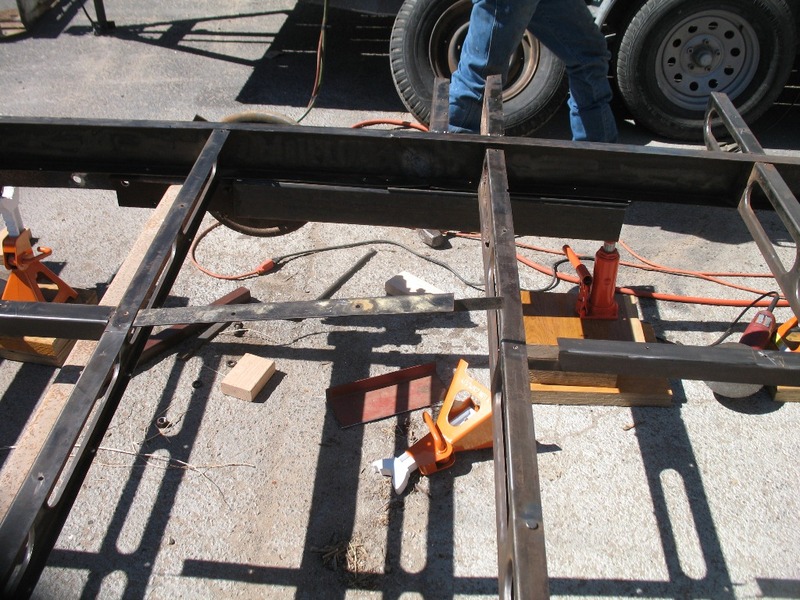 The welders came and began the process of fixing all of the various things that were wrong with the frame. 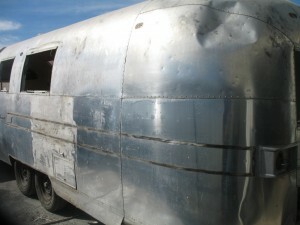 There had obviously been some frame damage at some point in this trailer’s life. The fix that had been performed has not held up well, so we decided to fix the issue, instead of just putting on another band-aid. 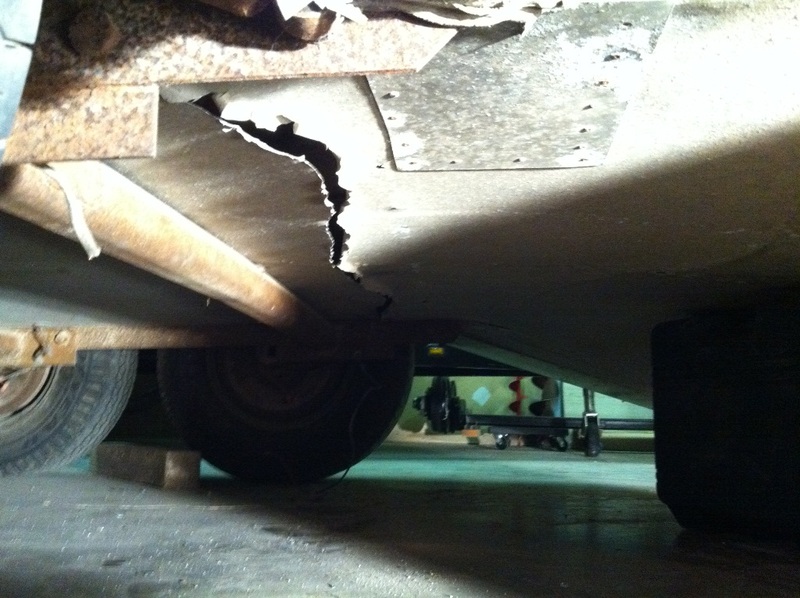 First there was about 4′ of frame to the bumper that needed to be completely replaced. 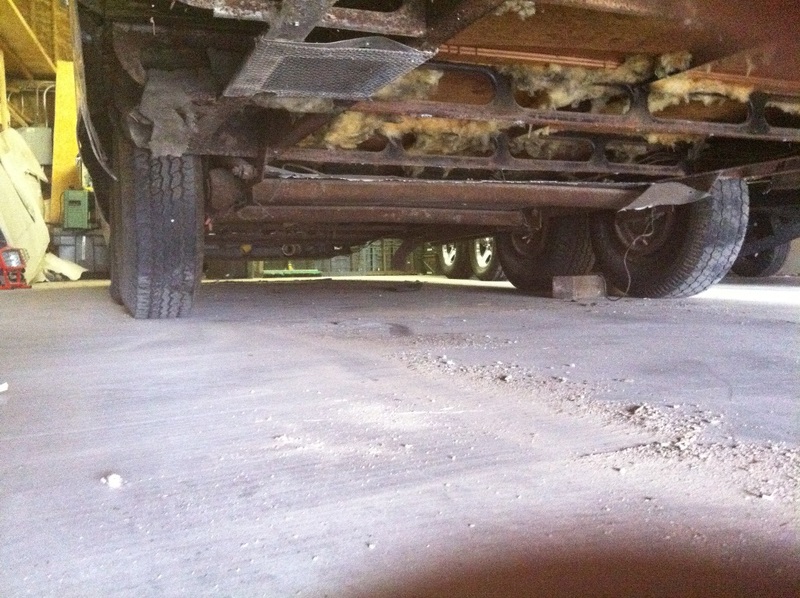 Once that was removed, repairs had to be made rear of the axles to the damaged frame. The frame was almost 2″ out of level from about two feet behind the axles to the bumper. The shock mount pictured in the last post was also fixed and reinforced. The welders really did an awesome job and they even took the time to straighten out the bumper, which was badly crooked. I didn’t take finished pictures of all of the frame repairs on Friday as the batteries in the camera died, but I will do that this week and post them as the frame is now in excellent shape! 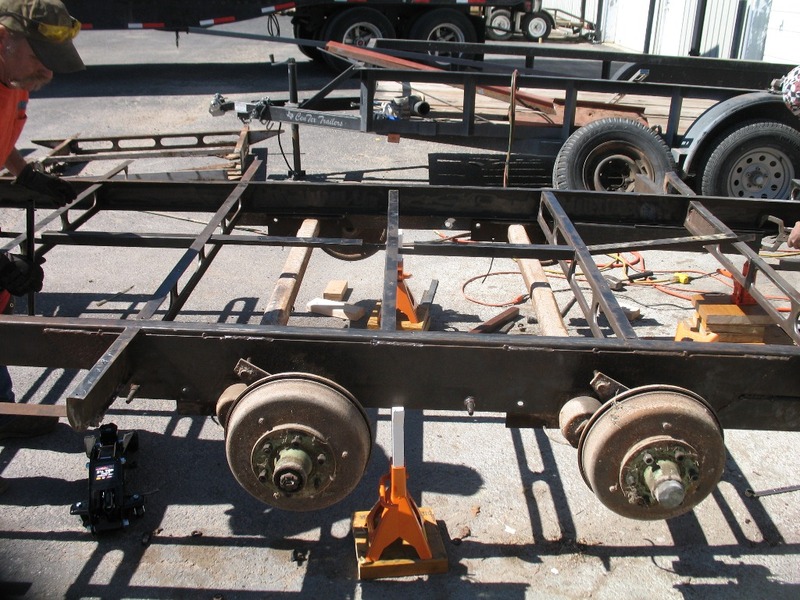 We removed the old axles and traded them to the welder, who is going to make a 30′ pipe trailer out of them. 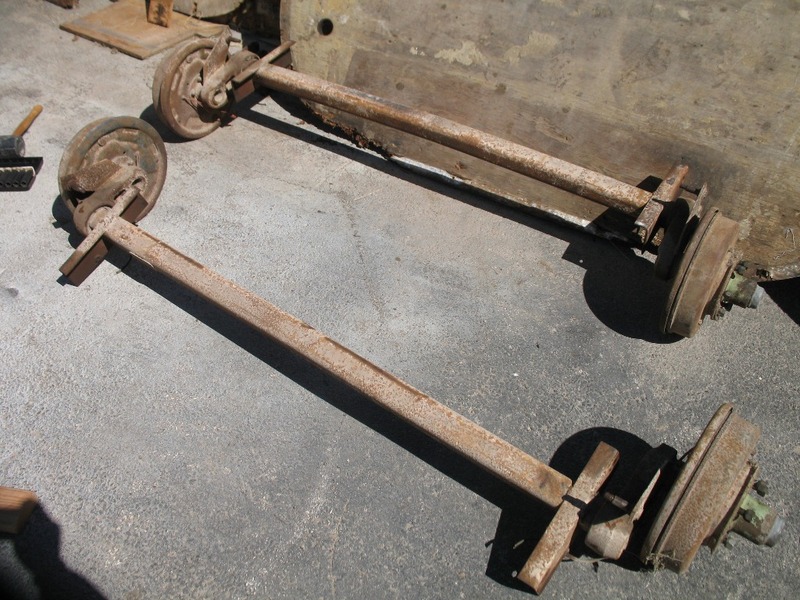 You can see from the pictures below how arched the old axles are! The new axles went in fairly smoothly, but we had to wait a few days for the axle shock mounts to arrive as they didn’t come with the axles originally as they should have. 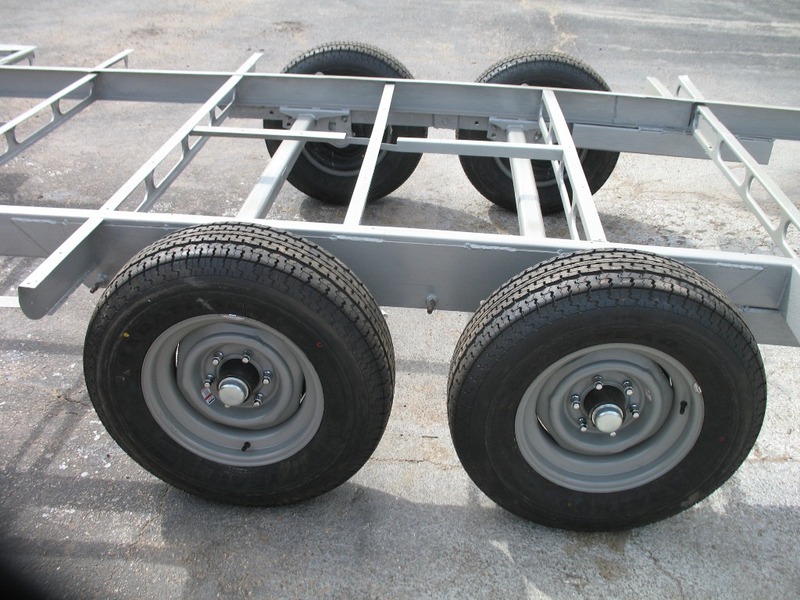 The new wheels/tires are also all assembled and ready to go onto the trailer after it is painted this week. 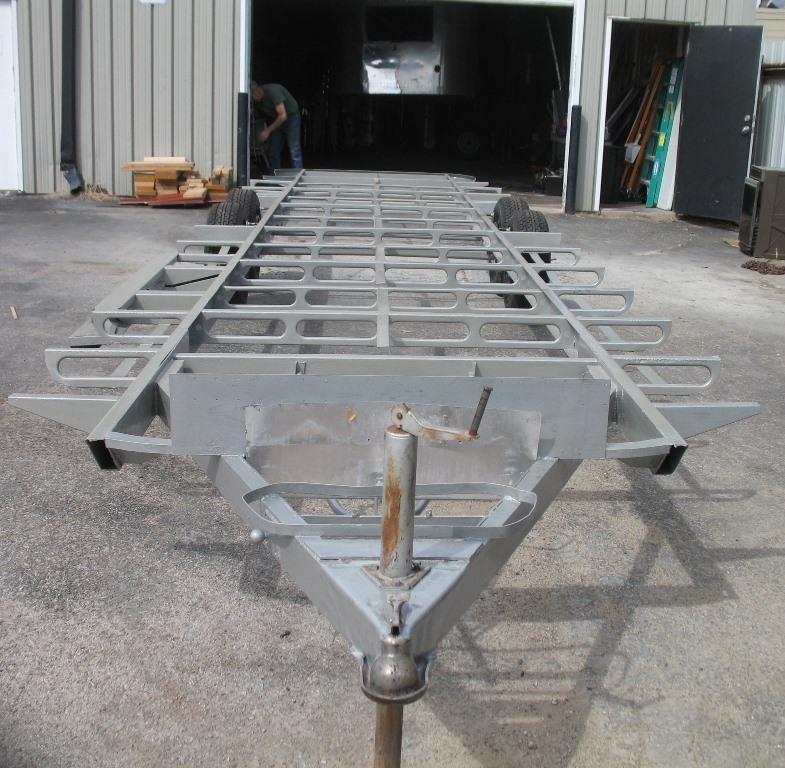 The welders also built us a set of 13′ custom A-frames. They are really nice and each one is built in 3 separate pieces that can easily be torn down and stored if needed. 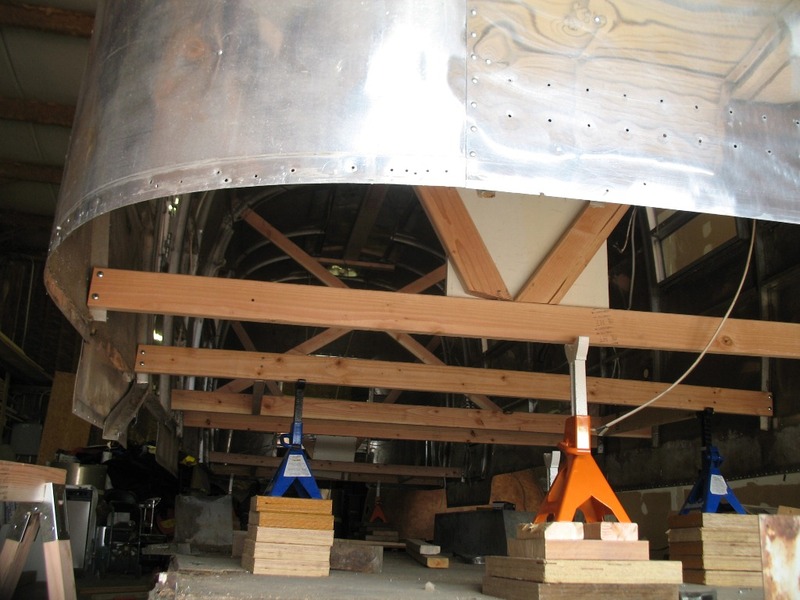 The sides connect to the beam with several bolts and are very stout. These frames are huge, but will allow us to lift the frame for painting early this week and then later next week we will move them inside the shop and use them to lower the shell onto the frame. 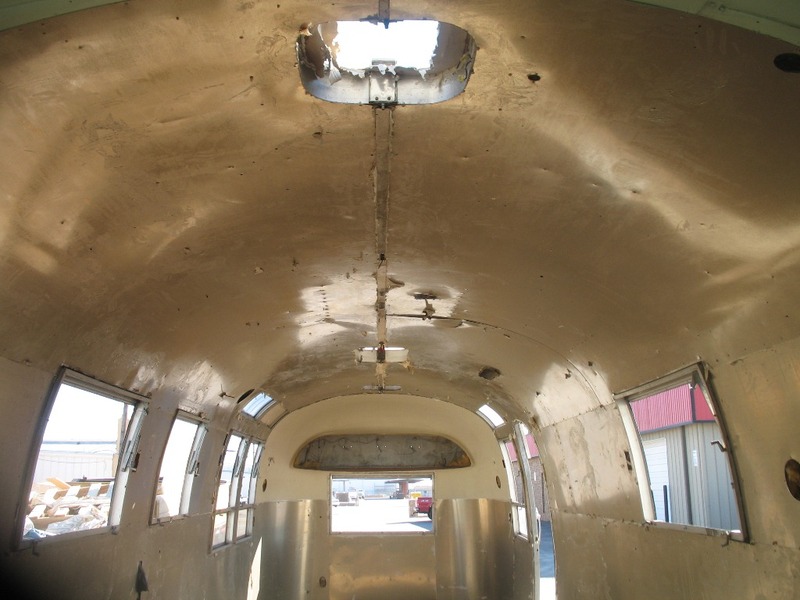 The next few weeks should be much more interesting visually as we are going to paint the frame, paint the floor with an epoxy, install the floor, and then get the shell back on the frame. 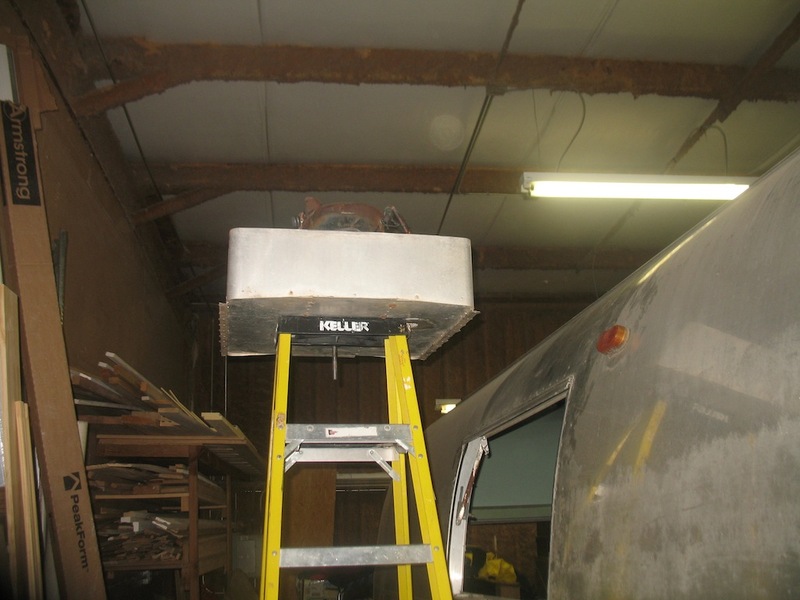 I need to order the aluminum for the banana wraps, so we might have to lift the shell off in the near future again to properly install the banana wraps, but we can get a lot of polishing work done and easily raise the shell as needed with the new hoists. Stay tuned! I should also mention this project is getting a ton of interest sitting out in the yard as it is now in this industrial area. We get people stopping by asking what we are doing and then some regulars that just want to see how it is progressing every few days. I am off schedule here a little, but we have all been sick here this past week again. Here is a picture of the frame after a first run of cleaning. It cleaned up really nice, but there is still more cleaning to come. 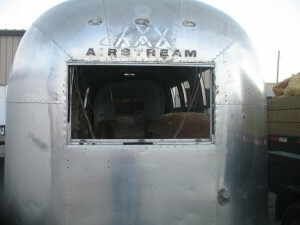 The frame looks so long without the shell and it is amazing how flimsy these Airstream frames are, but that is all part of the unique design that makes an Airstream and Airstream. It looks like at some point there was some major frame damage and you can see where an “attempt” was made to fix the issue. 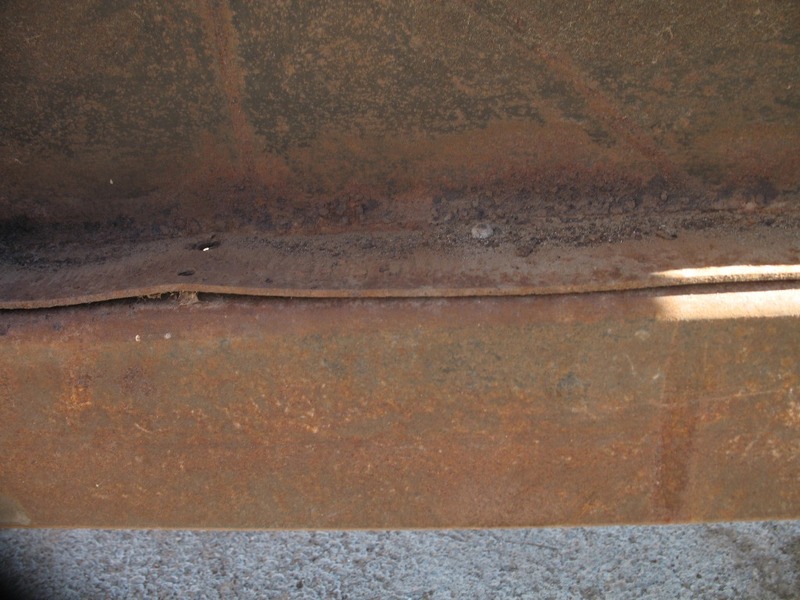 The rear portion of the frame from where that new weld is located is sagging and must be fixed. 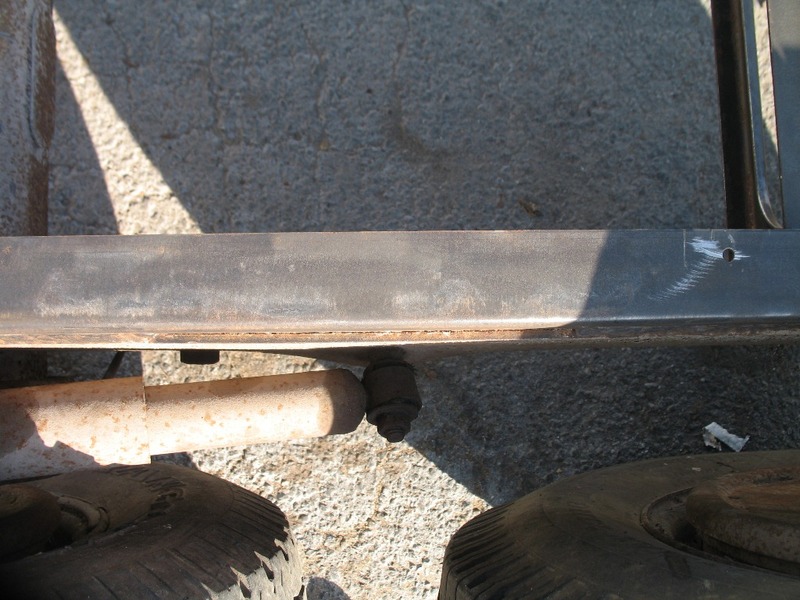 The frame is level up to that point, but is close to 2″ out of level by the time you reach the bumper area. Not good. You can also see where the frame bolt for the shock also has serious damage. I don’t think rear sag over many years caused that and I would be very interested to know what actually caused that damage! The welders were actually working on the frame today and made a lot of progress (lots of pictures during next week’s update). There was a lot more work required on this frame than I had originally anticipated, but we are doing it right and making sure it is fixed before proceeding. 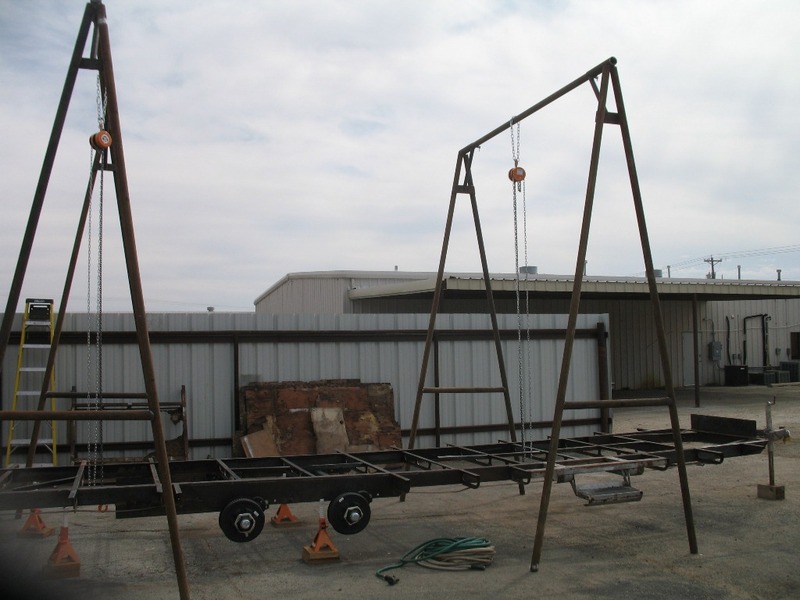 The welders are also building two sets of a-frames out of metal that are 13′ tall. We will use this from now on as our shell hoist and it will be a portable solution even at our new shop. 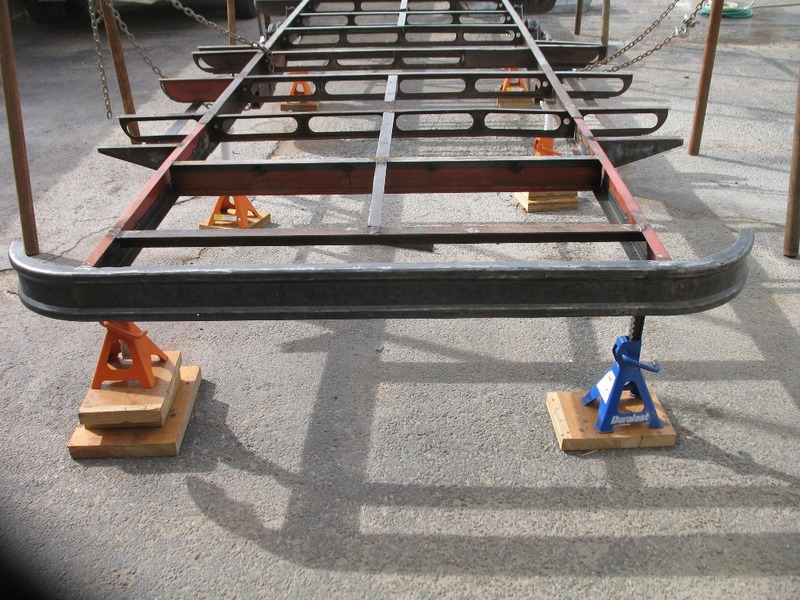 The new a-frames should be ready this week and the chain hoists are ready and waiting at the shop. 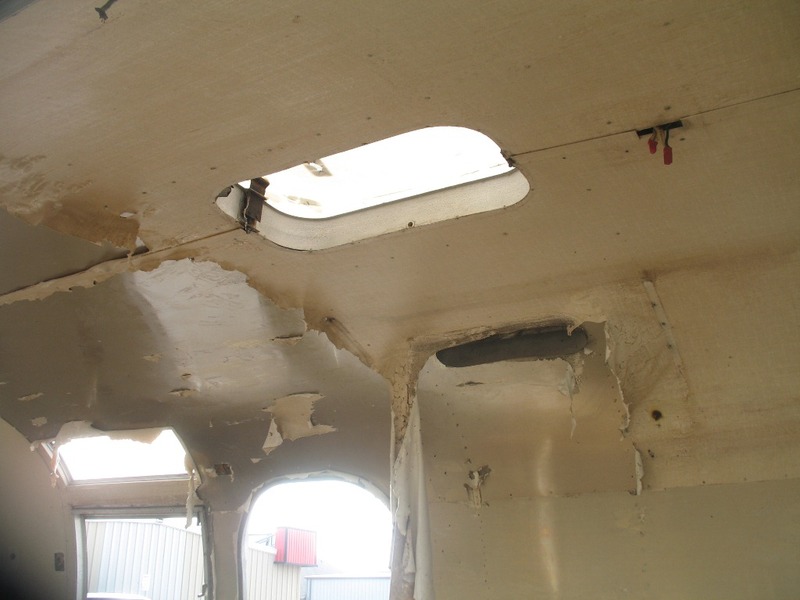 I will never again do a shell off the jack way and this will allow the shell to be gently lowered and positioned and even removed again if needed before bucking all of the c-channel rivets. I have to do a mid-week report of the progress as we have reached a really big milestone, the removal of the shell! 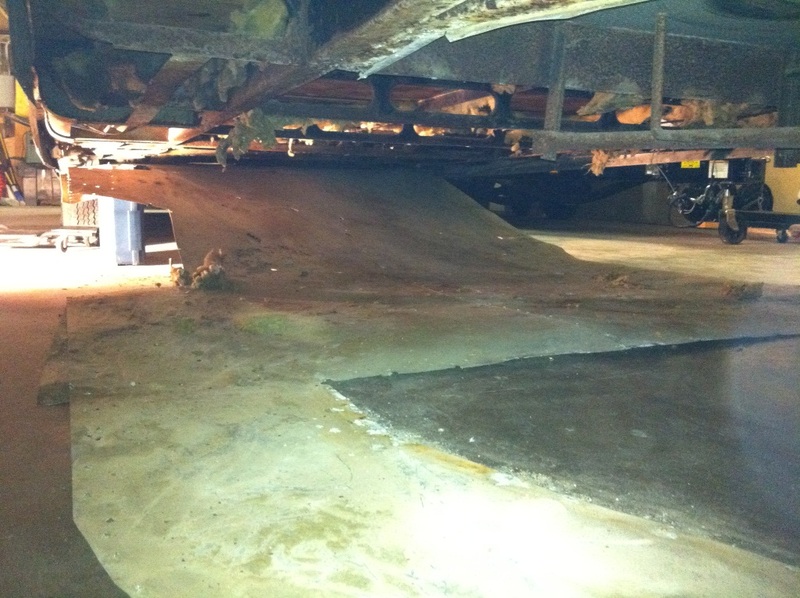 Phil did a great job getting the structure stabilized with a 2×4 structure that kept it 100% stable as it was removed. 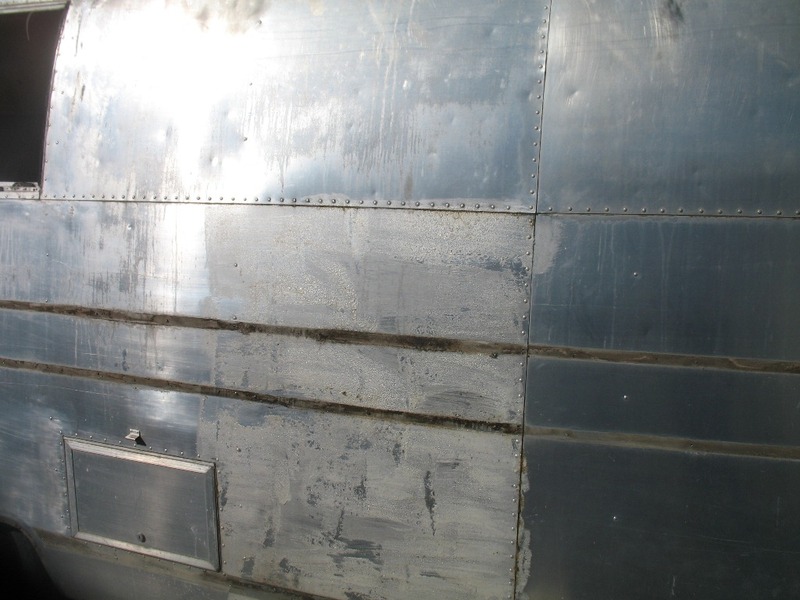 He also removed all of the lower rivets that were holding the outer skin to the c-channel. We are moving into another shop in a month that has incredible steel beams that you could lift a car on so we tried to get by with the bottle jack solution for this trailer, but boy oh boy I will never do another one with bottle jacks again. A hoist system is an absolute must for ease and safety. 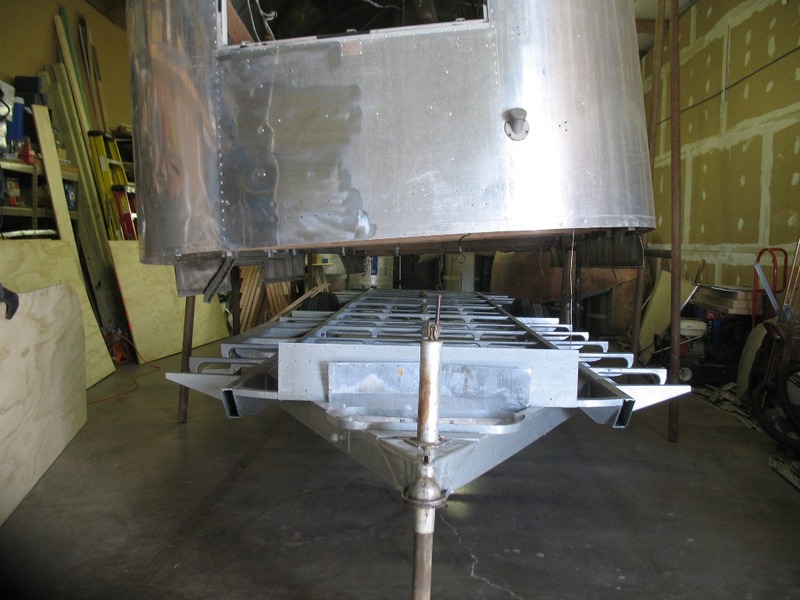 The frame of the ’67 was supported with a combination of some small bottom jacks and some jack stands. This kept the frame from moving while jacking from the top. Also, I would highly recommend only taking out the bottom inner skin and then using a hoist system as you don’t have to go through any of the extra trouble that we did for the way we did it, but again we did with what we had since the rafters in our current shop are not strong enough to handle lifting the shell we were dealing with. 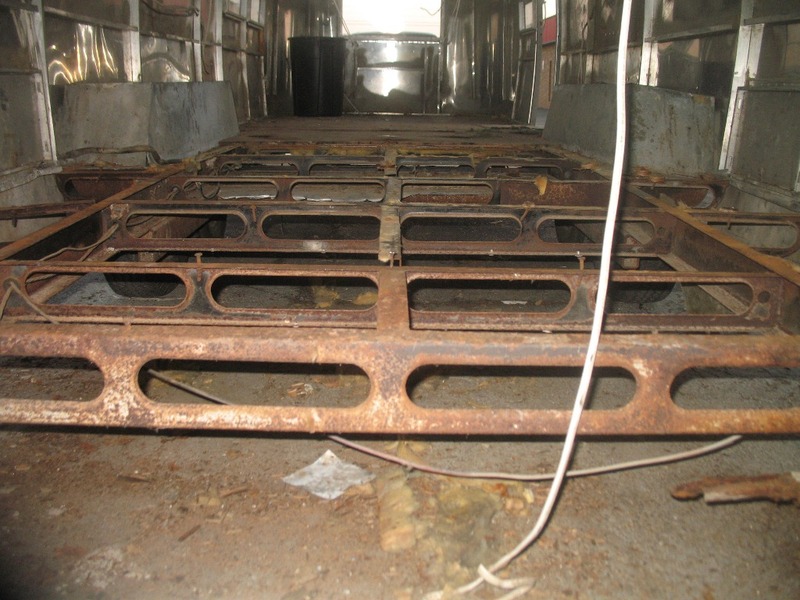 Bottle jacks and 2×12-2×10 blocks were used to do the jacking, while using jack stands in the floor of the trailer to keep things secure. The side panels of the ’67 are also interesting in that they go down another 6-7″ below the floor, so getting the entire structure lifted high enough so that it could then set down on the 4x4s which were sitting on saw horses was an interesting feat. There was a pretty scary bit and all I will say is if you are doing the bottle jack method take your time and make sure you have a solid and stable foundation for your bottle jacks. The shell was then blocked up from the 4x4s and attached to the 2×4 rib structure and it is rock solid. The frame pulled out perfectly and is now sitting in the yard waiting for the welder to come repair the rear section tomorrow. It is so great to have constant progress being made and Phil is doing a terrific job. 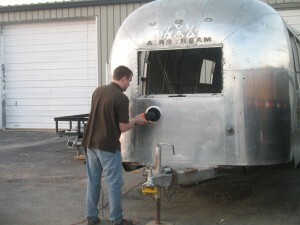 I think he will get the Airstream bug at some point! 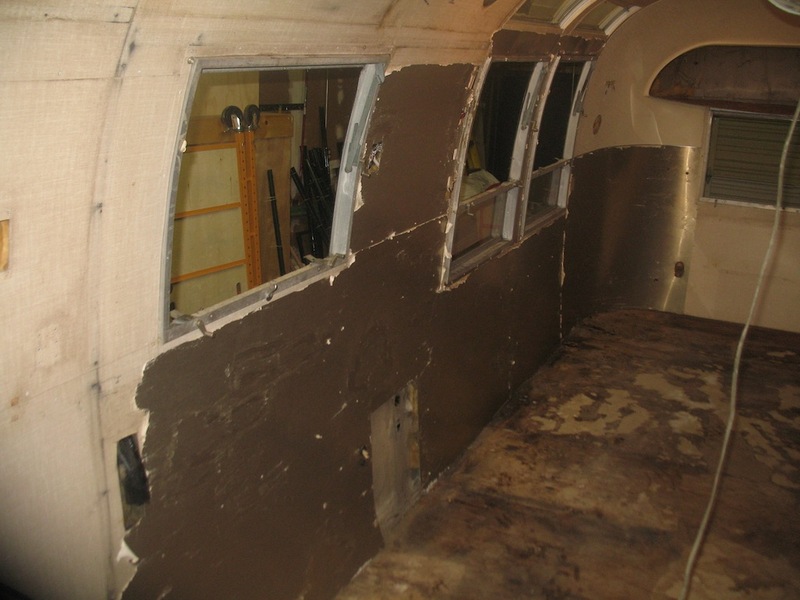 There is still a busy week ahead as the rest of the floor will be removed and then the actual restoration will begin on the frame with preparing it for the POR-15. 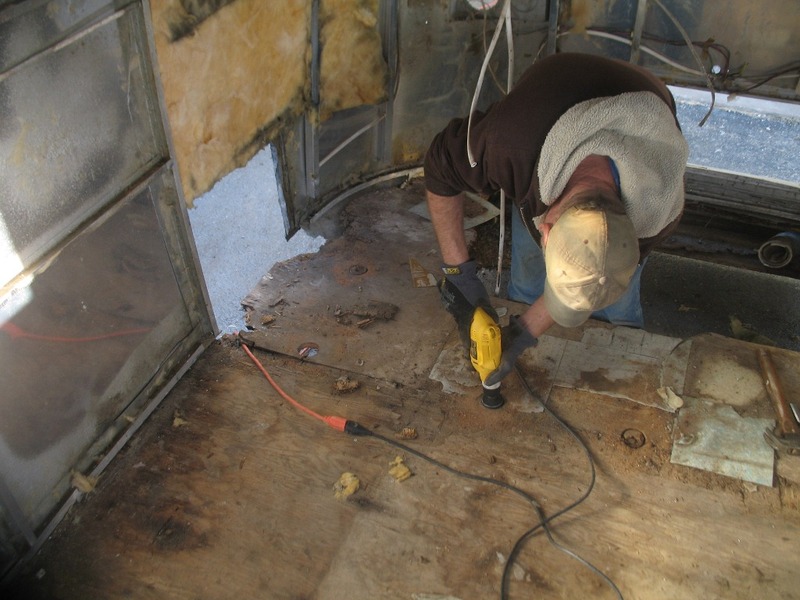 on removing the floor) to work on our project full-time starting this week and he has turned out to be a huge asset and is doing an incredible job. I would really like to do every bit of the work myself, but my consulting business keeps me too busy to really make much progress myself at the moment. 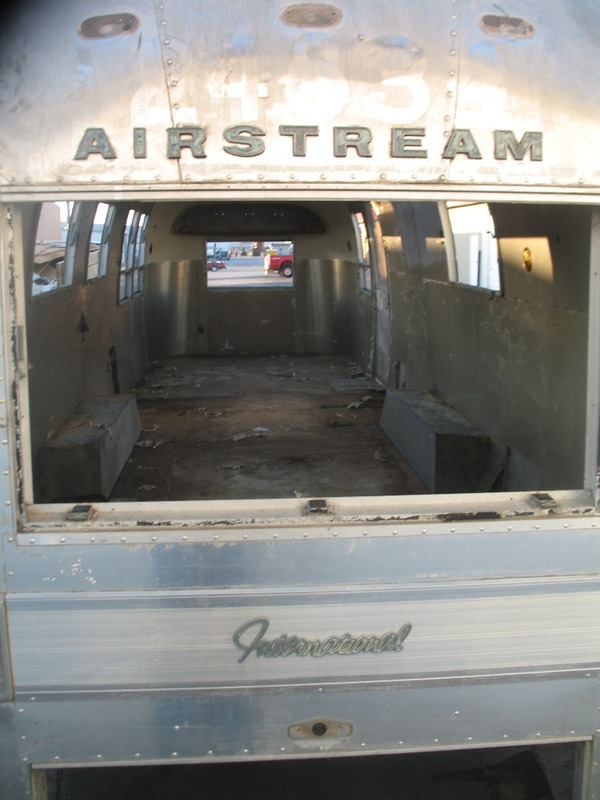 Anyone interested in a restored or semi-restored Airstream please let me know as I am going to turn this into a business after we finish the ’67. 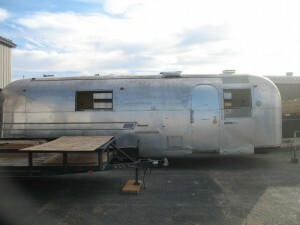 The week started off with moving the trailer outside as the weather is in the 70-80s here. 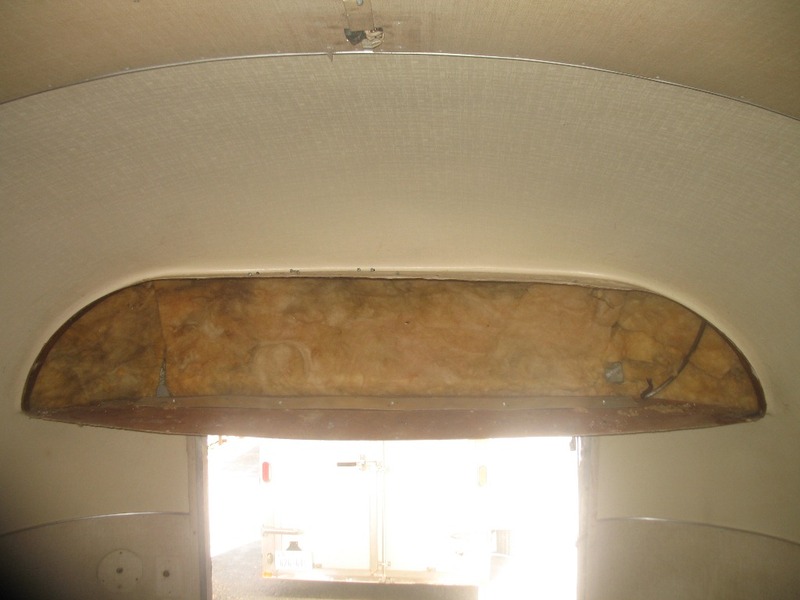 We started by getting 80% of the clear coat removed before running out of airplane stripper and are planning on finishing up the last 20% this coming Monday once we will have more product. 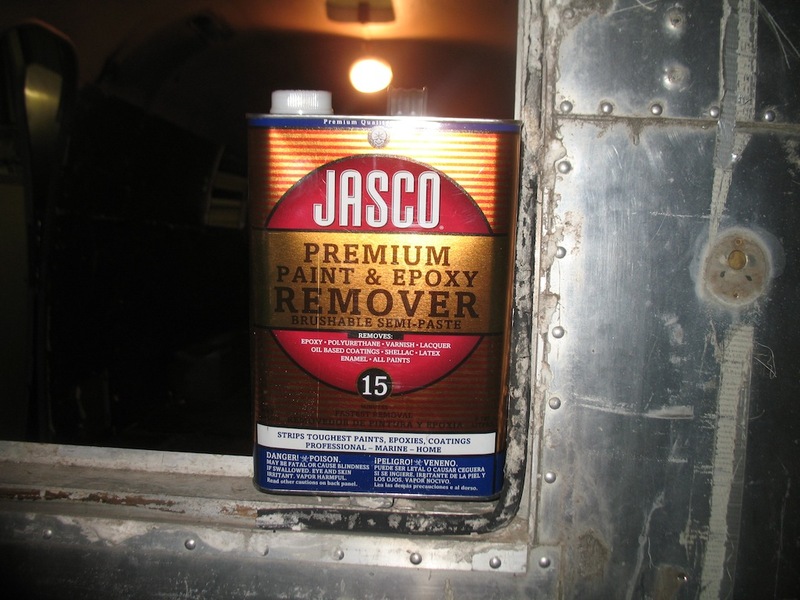 We tried Jasco, but the airplane stripper worked much better on the clear coat. The only place locally that carries the airplane stripper is Pep Boys and unfortunately they didn’t have much in stock. 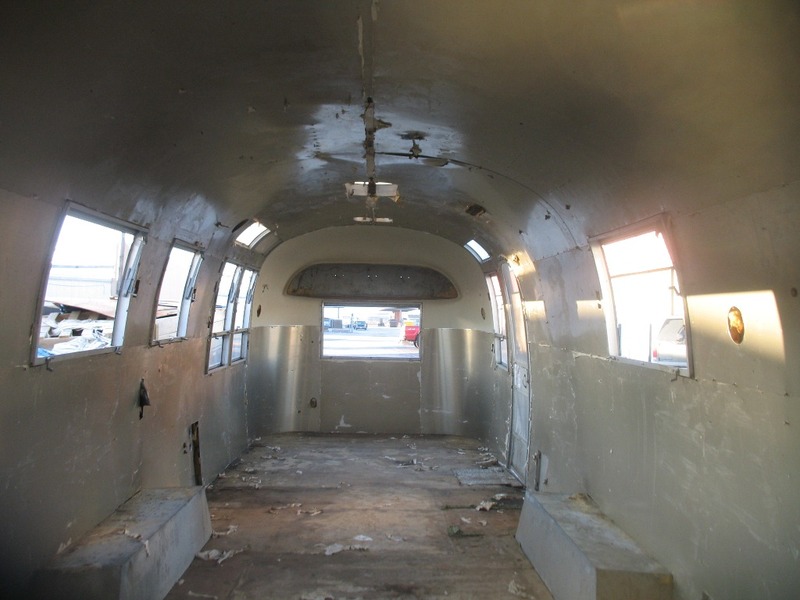 All of the name plates, emblems, and lights were removed and the windows that the PO had covered with plastic and duct tape were cleaned up and are now looking great. 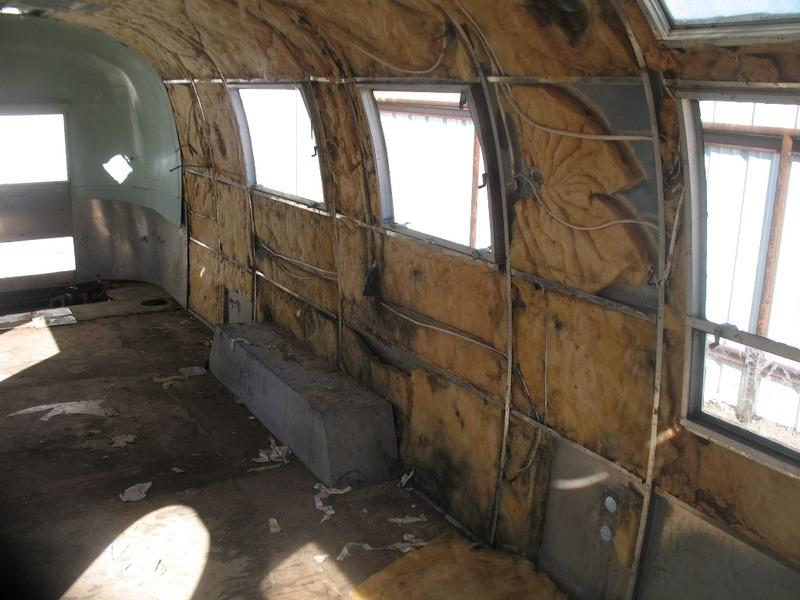 Next, we finished removing all of the vinyl from the inner skins, removed the inner skins, removed end caps, and all of the insulation. The skins came down very easily and having that all out makes it look like it is that much closer to the build back phase. 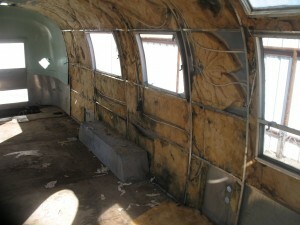 I have decided to use Prodex for the new insulation, so farewell to that itchy fiberglass stuff. 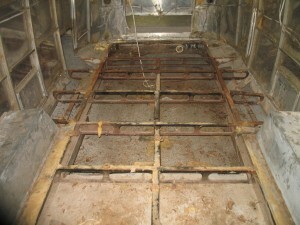 The next task was to remove the floor so that the welder could begin fixing the rear 4′ of frame. We drilled out around the elevator bolts and then used a multi-purpose tool to cut around the elevator bolts located around the perimeter of the trailer under the shell. This is my first time at any of this so there is a lot of learning, but by this afternoon we decided to turn this into a shell off restoration on Monday since it is barely hanging on at the moment. The rear separation is partially to blame, a broken outrigger, and then there are just way too many places where the shell’s C-channel is not attached to the chassis in any way at all. Having the shell off will allow us to more easily fix the frame, replace the flooring, and then make sure the shell is 100% secured and aligned to the chassis/floor as it should be. 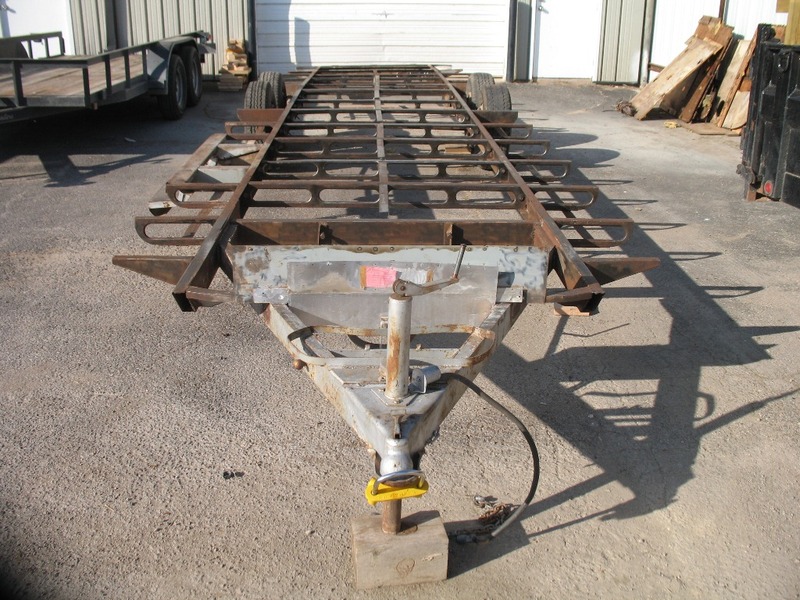 The good news is that it looks like the rest of the chassis is in excellent condition and the welders should be able to get the frame repaired sometime next week. The first batch of Nuvite finally arrived today so this evening I tried a little test area with the F7 grade. I think it is going to take some G9 in this front section and we might also try some rouge to get the 80% polish on its way. 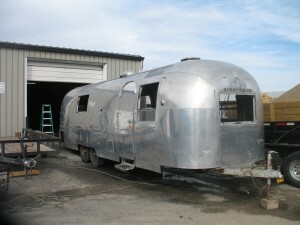 Polishing this trailer into a mirror finish is going to be a huge task, but will be worth it! 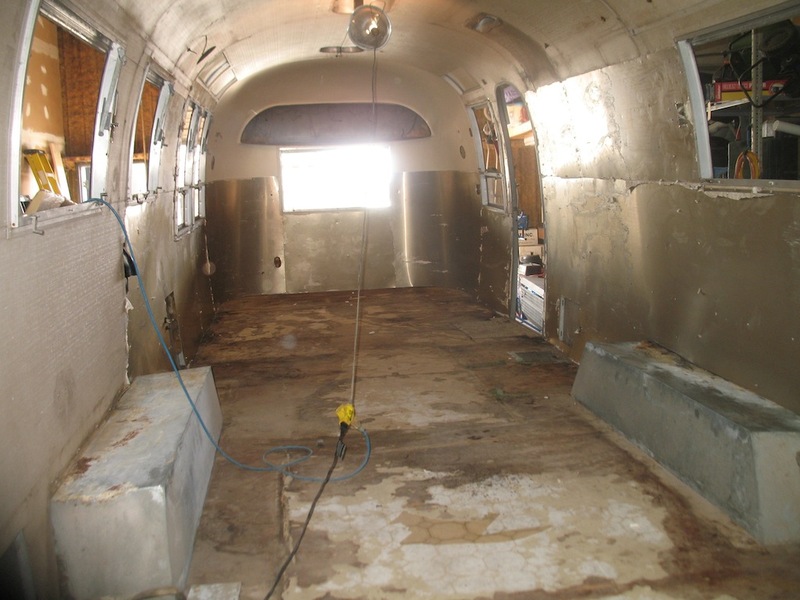 Next week we will remove the shell, finish removing the flooring, begin on the chassis restoration, and possibly install the new axles or get busy with the new floor! This update is delayed by two weeks as things have been a little off here lately. Two weeks ago a “blizzard” came through this area of Texas and our city is not setup to deal with 3-5″ of snow and 1″+ of ice under the snow. Anyway, no work happened on the trailer that week and then this past week my entire family and I came down with some type of a cold that took us out of commission pretty good. 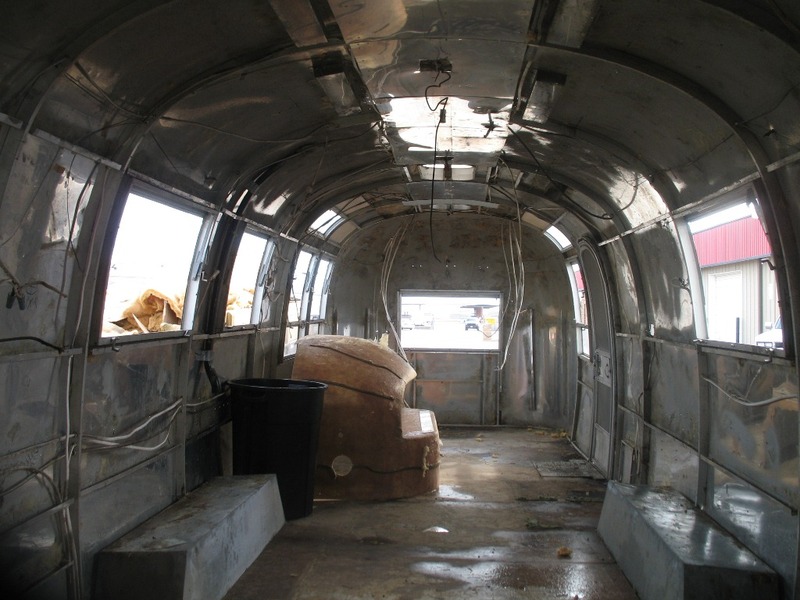 Well here is the update from several weeks ago now and this coming week is going to be full of tons of progress as we will finally have help to remove the clear coat, finish stripping the upper inner skins, and finally remove the inner skins. I have the POR-15 products sitting here ready for the chassis restoration to begin in the next week or two. The AC is now completely off and was a fun little project to do by myself. I have not weighed the unit yet, but it was fairly heavy (I’m guessing 60lbs+). I lifted it off the roof by myself and set it on top of an 8′ ladder and then onto a 6′ ladder before it came to rest on the floor. 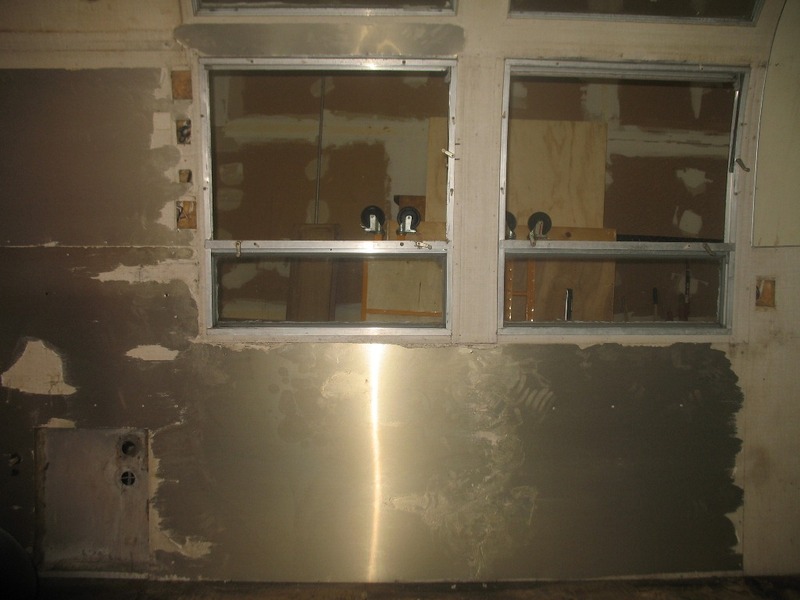 Here are a bunch of shots of the progress that was made on removing the vinyl. This is an easy task, but just time consuming. I have a pretty good process that involves two coats that works really well. We now have all of the vinyl off of the lower walls and just have the upper two panels to do the length of the trailer. 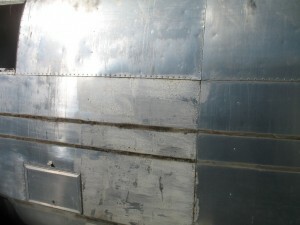 Then we need to remove some of the left over residue, but that can be done once the panels are off. 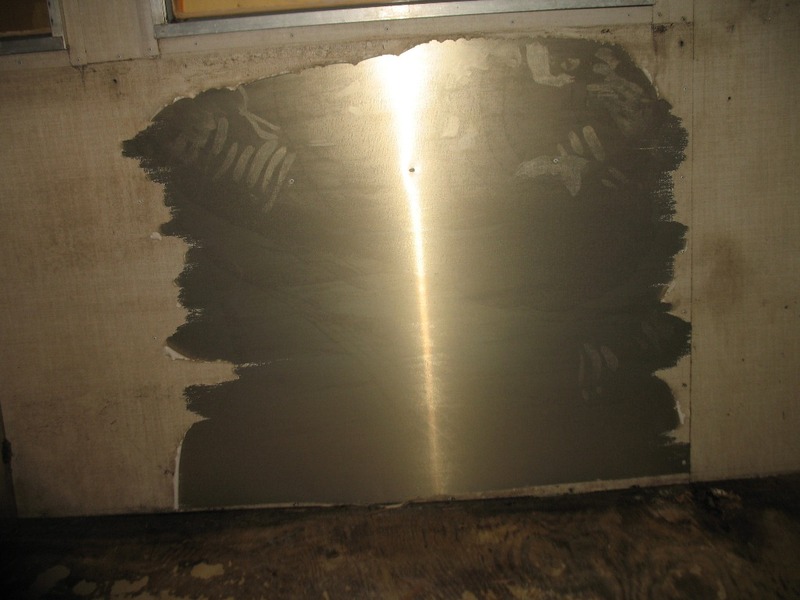 This is the fantastic stripper product that makes removing this vinyl an easy task. I have done most of this in an enclosed shop since it has been cooler. The fumes are not bad at all, but it does burn like crazy if you get it on your skin, or in your mouth…note to self keep mouth shut when yanking off the vinyl as some of the remover might fling off into mouth. I am going to go to a weekly update as my schedule is really busy and also there is going to be a lot happening with the Airstream in the coming weeks. This past week was busy with more cleanup and preparation work. I finally got around to removing the old water heater, furnace, front bulkhead, lower A/C console, all outlets, removed the wheel well covers, and anything else attached to the walls. 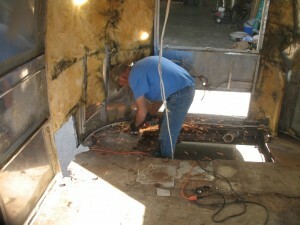 The walls are now being stripped before we take down the inner skins. I have tried various ways of applying the stripper, but in the end, making sure to have two heavy coats of the stripper is key and no need for any plastic wrap. Here are some photos from this past week. I have been dreading this day for awhile as I knew this task would either be a walk in the park, or more likely a nightmare that I would never forget. 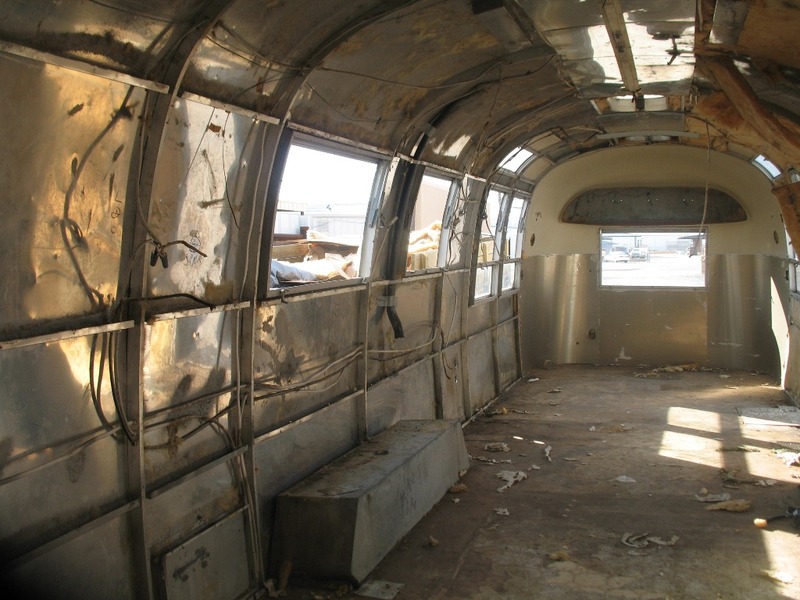 The ’67 has the vinyl clad aluminum walls, which basically means it has vinyl wall paper on top of the aluminum inner walls (aka skins). 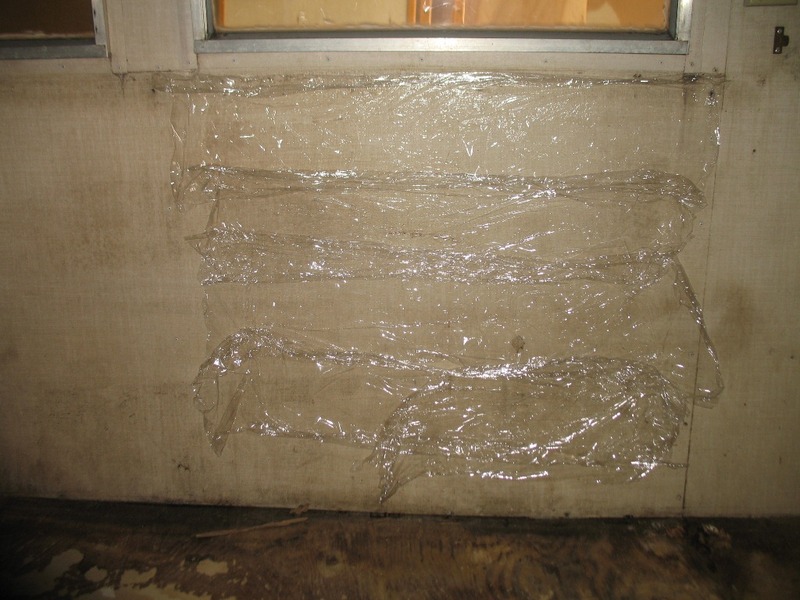 This stuff is notorious for being impossible to remove as the bonding process they used was very effective.I decided to give the process a try under the first front street side window. I have done a lot of reading and researching on various experiences and finally found a couple that found a product that they claimed “worked like a dream”. I went to our local Lowes and found the product (9 years after the account I read about), which was amazing that the product was still available. I then also followed another couple’s advice that said that applying the stripper and then placing plastic wrap over the stripper would help the vinyl absorb more of the stripper. I was very skeptical. It worked! This worked way better than I even imagined and I think I could remove all of the vinyl from this 30′ in less than 8 hours easy. The test area pulled off all in one piece like a big latex balloon. It was pretty amazing how it would not even budge around the areas that had no stripper applied to them yet. There wasn’t even much adhesive residue left and I am sure some mineral spirits will have that all cleaned up in no time. 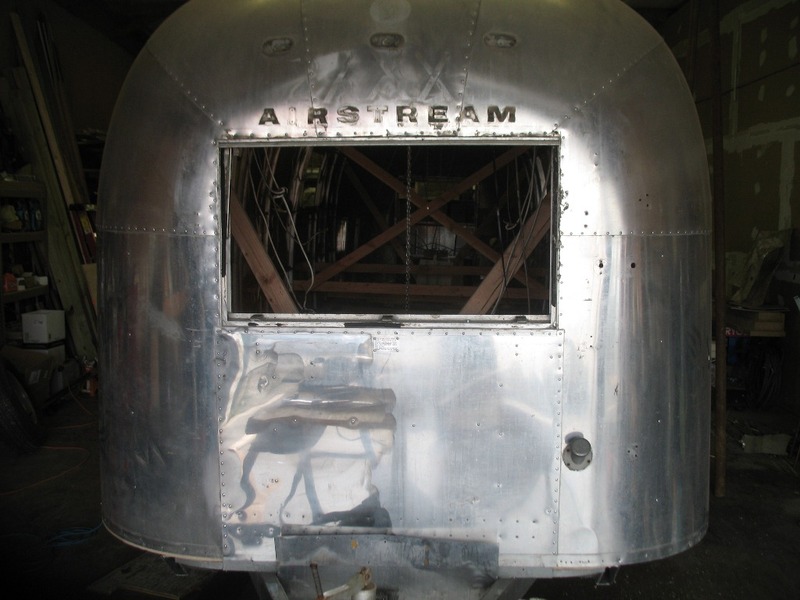 This is by far the easiest task I have worked on so far with this restoration! 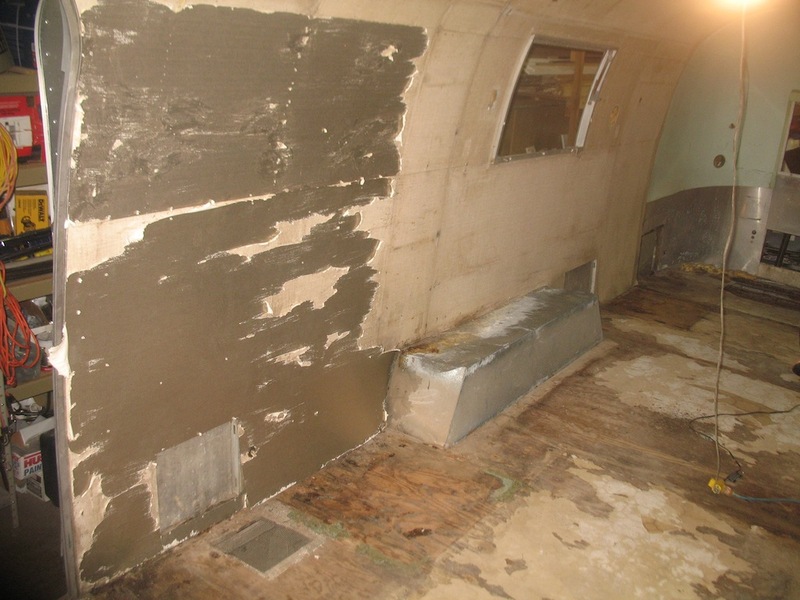 Here is the link to the forum thread where I found all of this very useful information: http://www.airforums.com/forums/f39/stripping-interior-vinyl-covered-walls-2625.html. 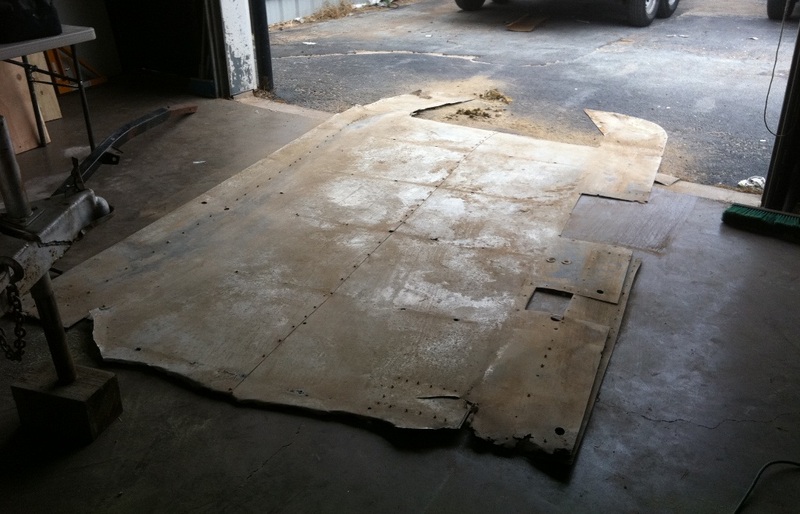 The belly pan has now completely been removed and is folded up and waiting to be used as a pattern for the new belly pan. The rivets have been removed for some time, but I simply haven’t had time to finish removing it until now. I then slid out the front and rear pieces and folded them up into quarters for easy storage. Things are starting to look really nice!